Since the day Sam Walton opened his first Walmart store, he and others fostered a culture of caring, compassion and opportunity among all associates. When people face an unexpected tragedy — a fire, a flood or the death of a loved one — it can be overwhelming for them and their families. The Associates in Critical Need Trust (ACNT), a public charity created in 2001, provides grants to U.S. associates experiencing economic hardship as a result of an unforeseen crisis. Walmart contributes to the Trust, as do the Walmart Foundation, the Walton Family Foundation, associates and Walmart alumni. Since 2001, the Trust has provided more than 125,000 grants totaling more than $100 million to associates in need. In FY2015 alone, ACNT helped 342 associates impacted by natural disasters who needed food, clothing or shelter, and 3,849 associates impacted by loss of household income due to circumstances such as a death in the family or a spouse losing their job. For more than three decades, the Walmart Foundation has committed to making resources available to help U.S. associates or their dependents who are high school seniors fulfill their educational goals through the Associate Scholarship Program. The funds can be used toward a two- or four-year college degree, or a trade or technical school certificate. 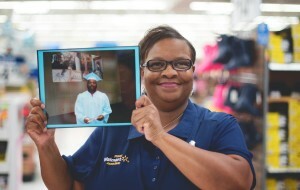 The Walmart Foundation has funded more than 800 scholarships for U.S. Walmart associates and their dependents, with support totaling nearly $4.7 million. Rather than make one-time payouts, we require each scholarship recipient to maintain a minimum 2.0 grade point average and either 12 credit hours per semester for dependents or three credit hours per quarter for associates. Those who meet the criteria are eligible to renew their scholarship for further assistance with a total contribution of up to $16,000 for associates or up to $13,000 for dependents. The number of eligible recipients is limited by the IRS.